Written by Shayla Price on March 9, 2018 . The invoice is a critical message in the customer experience. Beyond accuracy, what also matters is the design. A poorly designed invoice email can cause customer confusion and even frustration. This pain point then could lead to a bottleneck in your payment collection. Well-crafted invoice emails streamline the billing process, strengthening your lifecycle campaign. Plus, they keep your company top of mind with customers. So how do you infuse a little more pizzazz and a lot more value into an otherwise bland transactional email? You redesign your invoice emails. We have a few invoice email design strategies to help your team. Let’s get started! 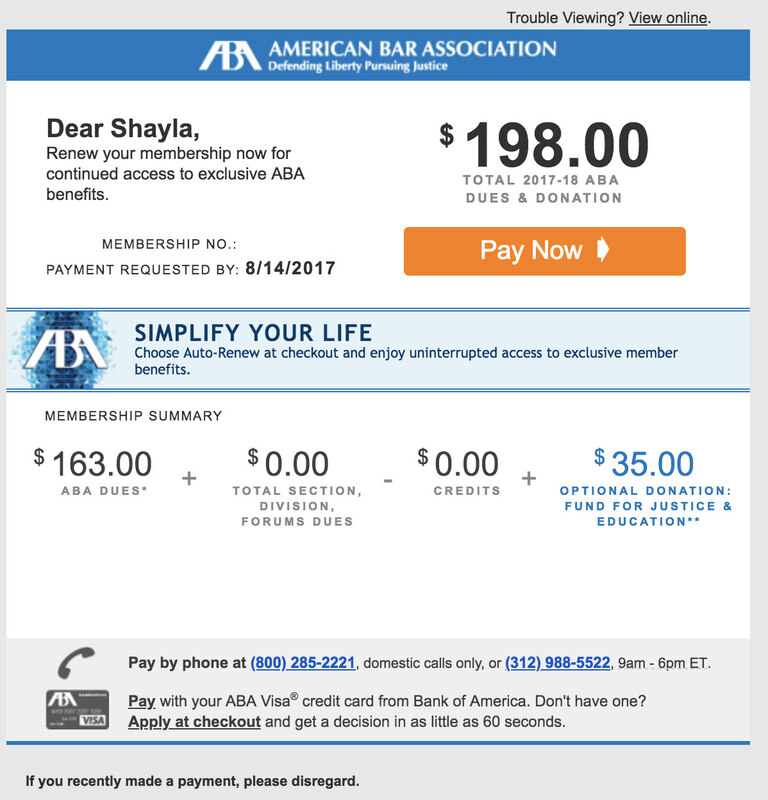 In the example below, the American Bar Association provides the recipient with all the pertinent information to move forward. The organization even breaks down the total due in a membership summary. Then, the orange call-to-action button expresses the need for action now, rather than later. When crafting your content, you’ll also want to be mindful of your tone. Stay away from rude, forceful language. Instead, aim to convey concern and urgency in your message. That’ll nudge customers to take action. If you walk into a fast-food restaurant, you probably can guess the location of the restrooms. That’s because most of these businesses have a similar building layout. Your invoice emails should fit the standard structure of your industry and cultural norms. You want customers to open your email and know exactly where to find the important details. The goal is to keep it simple. Don’t feel pressured to squeeze unnecessary information into tight spaces. And don’t compromise your layout for a wacky design that complicates the email’s function. When creating your layout, think about the sections you want to include. Grouping content makes it easier for the recipient to digest. Check out this invoice email from the chiropractic office of Shaun Jennings. 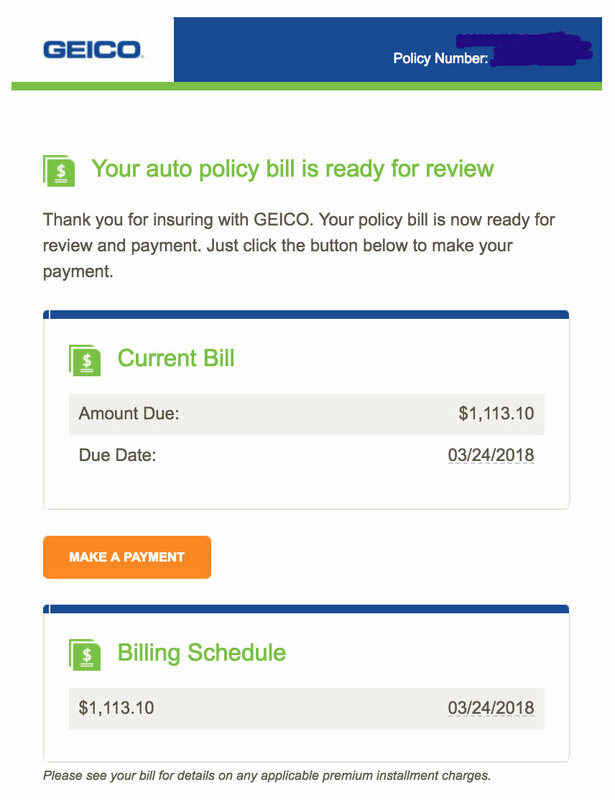 There’s a section for stating the business’s name, a section with a call-to-action button, and another section outlining the billing summary. You’ll notice that this invoice email adds plenty of whitespace. This tactic makes the design easy to read for the customer. The horizontal rules provide organization to the invoice, too. Visual appeal holds significance, no matter the type of transactional email. You can declutter your invoice emails with a neat layout that quickly draws in the customer. Your customers lead busy lives. Between shopping for the family and completing major work projects, the last thing on their minds is paying another bill. Like any message, you want your invoice to stand out from the rest. You want customers to take notice (and action) immediately. Surprisingly, humans are hard-wired for curiosity and are always seeking out information. You can use our innate behavior to boost your click-through rate. A simple strategy is to increase the font size or change the font color of the details you want the recipients to recognize first. This small adjustment places emphasis on what content matters most in the email. GEICO gives a good example to follow. In this invoice email, the larger green font signifies to the recipient that he owes a bill. Their team also highlights the amount due with a different color. And of course, the orange call-to-action button with white text is hard to miss. When selecting colors, think about matching the email design with your company’s branding. 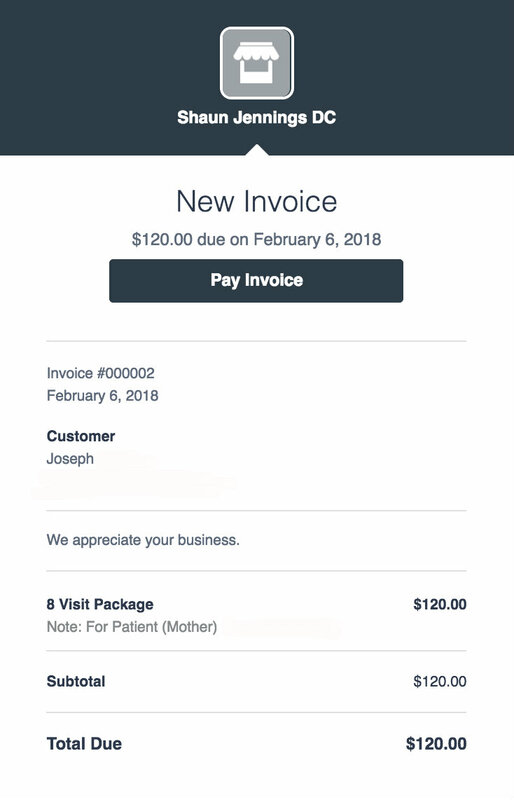 This consistency will give customers a way to connect your invoice email with your products and services. You can direct your customer to key details with font size and color. Just don’t go overboard and emphasize everything in the message. Litmus reports that more than half of customers open their emails with mobile devices. It’s a stark reminder that your invoice email design must be mobile responsive. But what does that really mean? Responsive email design gives recipients an optimal viewing experience across multiple platforms. It adapts to the customer’s device, whether she’s using a mobile phone or a tablet. Without responsive email design, your customers may find it difficult to read text, see images, or click links. They’re stuck in a desktop viewing mode on a mobile device. Yikes! Common uses of responsive design techniques include scaling images, adding padding, and hiding content. As always, you’ll want to experiment with what works with your audience. 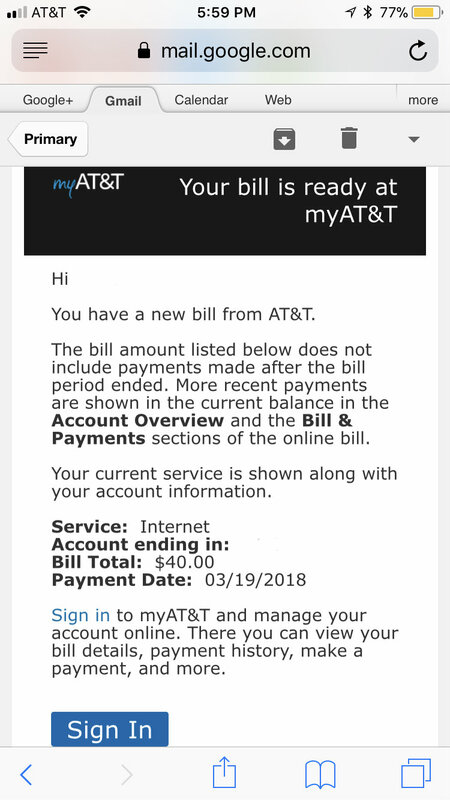 Ovi Demetrian Jr, founder of Blocks Edit, offers his viewpoint on designing effective invoice emails: Below is an invoice email example from AT&T. All the vital billing information fits the mobile screen. The font is large enough where the recipient doesn’t have to squint. Also, it only takes one finger to click the call-to-action button. From optimizing images to adding spacing, you want to make the text and visuals easily viewable. Your team should make design adjustments to improve the customer’s mobile experience. Invoice emails keep track of purchase history, but they also can help the customer move to the next stage of the lifecycle journey. Smart businesses don’t leave their customers in limbo after a purchase. Instead, teams look for opportunities to nurture customers into brand advocates. The invoice email is the prime time to inform and delight the customer. You already have their undivided attention. Why not take advantage of it? Helpful customer resources include any guides or support documentation on how customers can get the most out of their purchase. You can link to new product releases, highlight recent company changes, or invite them to an upcoming event. They key is to add resources that matter to the customer. Avoid using it as a chance to make another sale. Customers can tell the difference between a hard sales pitch and a friendly product suggestion. 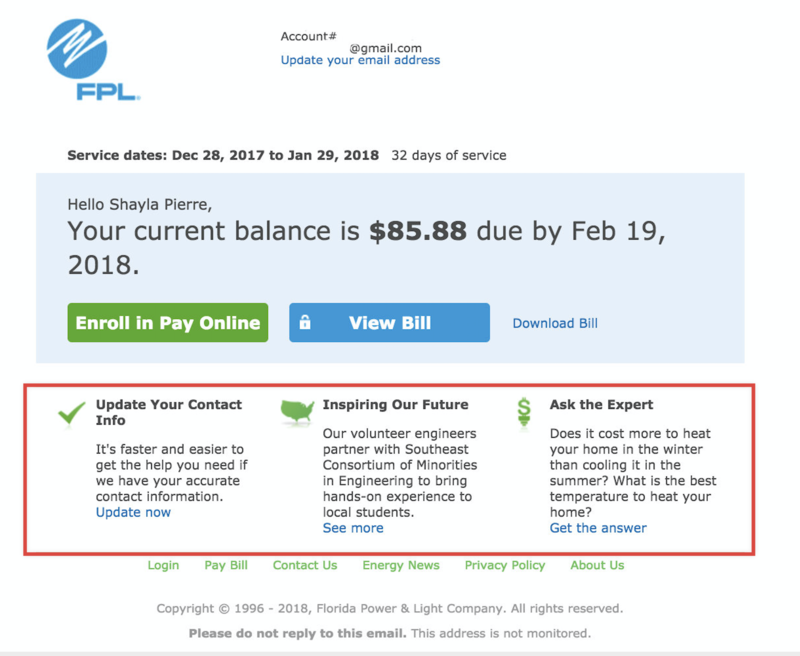 Florida Power & Light believes in helping their customers. Their invoice email offers valuable information about updating contact information, learning about the brand’s volunteer efforts, and getting experts to answer customer questions. Design centers around making the customer experience better. The same rule applies to invoice emails. Work with your team to combine the two and give your customers valuable resources. Invoice emails are an essential part of your business strategy. Keep the payments rolling in with meaningful content, a splash of color, and a mobile responsive design. It’s never too late revamp your lifecycle campaigns. How do you design your invoice emails? Let us know in the comments!